Just before the holidays, I took a little hike into downtown La Paz to go pick up some gear I needed from one of the local hardware stores. During the frenzy of the fishing season, I don’t often get a chance to get out let alone take a walk down the waterfront and into town. Seriously, in the course of about 8 months of craziness, walking about 8 blocks might as well be a cross-country excursion. There’s just no time to go strolling when you’re going full turbo shuttling folks to and from airports; shoving pangas off the beach; packing fish; tracking down a piece of luggage or trying to figure out who doesn’t want salsa in their lunch burritos for the next day fishing! Anyway, my walk got a little depressing. Old Juancito’s little taco stand had closed. I think it has been on that corner over 30 years. The little French place had a “SE RENTA” (for rent) plastered over shuttered windows. In fact, I counted 4 restaurants that had closed as I walked along. It included some pretty fancy places too. One little Bed and Breakfast had a “For Sale” sign stuck out front and it was clearly no longer open for business. I got hailed by Jose Luis, driving a taxi. He stopped to wish me Feliz Navidad. “Why are you driving a taxi?” I asked. I get asked a lot if the downturn in the U.S. economy has affected us in Baja. Most folks are touring visitors so they only see 3, 5 or 7 day chunks of life through the picture-perfect postcard perspective of a hotel or timeshare where superficially, all looks rosy. It’s vacation! It’ supposed to look like a postcard. However, I can’t think of too many places or too many people that have not been affected by the crunch anywhere on the planet…at least not in my circle of friends or places I know. As the dollar goes, the rest of the world goes as well. I know of at least five big multi-million dollar real-estate projects around La Paz that will never be completed; have gone bankrupt; or are simply languishing vacant stoically waiting for the relentless Baja desert to do what it has been doing for ages…re-claim them to the weeds, sand and dry winds. I can’t speak for the rest of Mexico or even the rest of Baja, but I can’t imagine it’s too much better. I think because in Southern Baja, so much of the economy is based on disposable income whether it involved tourism, real estate investments; vacation homes and land speculation, it may have taken a longer time for the economics to crash, but it may take even longer to recover. It’s a trickle-down effect. You can point the finger at the economy; fear of swine flu or nervousness of drug violence. But the triple whammy effect is the same. If the fishermen aren’t coming down with their buddies and families; if people aren’t buying land or condos; if cruise ships aren’t dropping anchor; if vacation homes aren’t getting constructed; then no one is buying gas. Fewer people are eating out. No one is shopping for t-shirts and trinkets. Fewer margaritas are getting ordered. 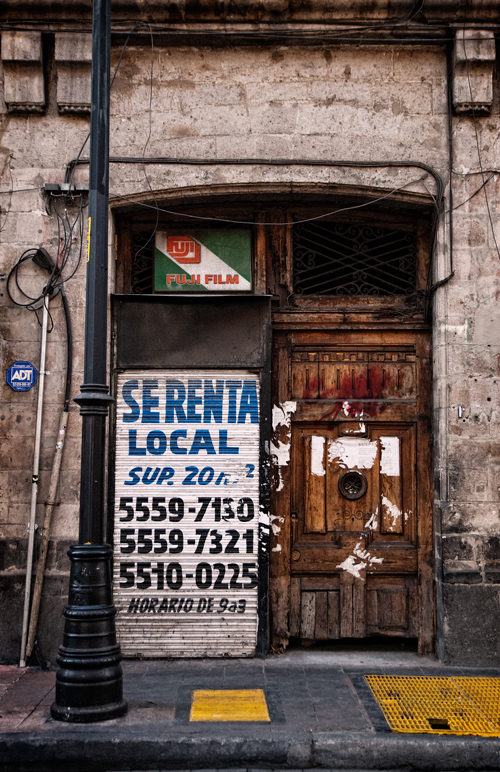 Whether you walk some of the business streets of La Paz or the marina in Cabo San Lucas, the commonality of boarded shops or “for rent” signs is unmistakable. Those that are open have restricted hours; have cut back on staff; or changed other aspects of doing business. I kid you not. Parts of the once-bustling waterfront/ marina district around Cabo are a virtual ghost town at times. At our own restaurant/ bar in La Paz, I get a constant stream of job applications from skilled chefs that worked 20 years in a big-chain hotel; or waiters who spent an entire career waiting on the rich and famous now asking if we have a dishwasher position open. Anything. Another usually bustling eatery told me they had just one dinner table all evening. For three days, they didn’t have a single patron. I get regular inquiries from fishing captains asking if I have any positions in my own fleet because they’ve not had a single trip in 1, 2 . . .3 months. So, yes, our little slice of Mexico is going through a rough patch. I wish there were some answers.